Here’s a great find, courtesy of horror film expert and collector extraordinaire George Chastain. 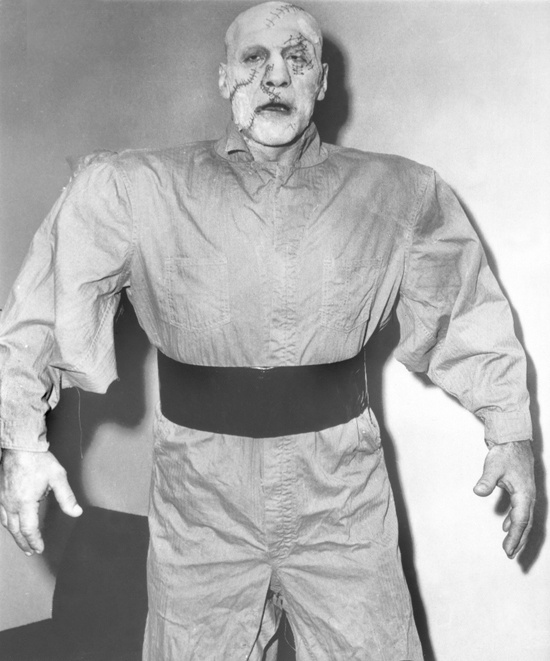 Previously circulating as a blurry thumbnail, here, at last, is a large, sharp image of Primo Carnera as TV’s Frankenstein Monster of 1957. The show was NBC’s anthology series, Matinee Theater, beamed live and in color at noon — 3PM on the East Coast — out of Burbank’s Color City Studios. 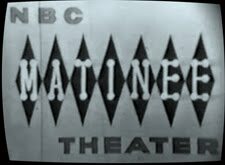 Running from 1955 to 1958, Matinee Theater would tally an astounding 650 episodes, offering a mix of original teleplays and adaptations of classic novels. A generous selection of horror, science fiction and fantasy titles included Dr. Jekyll and Mr. Hyde, The Tell-Tale Heart, The Fall of the House of Usher, The Cask of Amontillado, Death Takes a Holiday, and The Bottle Imp. John Carradine played Dracula with a mustache and a Grampa Munster haircut. A version of The Invisible Man was hailed by TV Guide as a television milestone for its pioneering special effects. In fact, the whole series was a bold experiment, with a rotating crew of directors producing five hour-long plays every week, testing the RCA color equipment along the way. The Frankenstein episode’s Monster was played by Primo Carnera, one of the most storied and tragic sports figure of the Twentieth Century. 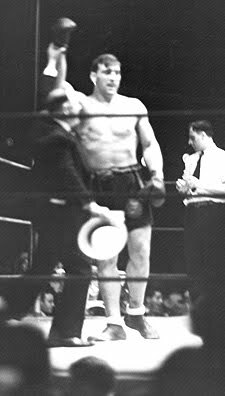 Born in Northern Italy, stricken with acromegaly, he stood 6 feet 6 inches when he began his career as a circus wrestler, barnstorming through Europe, taking on all comers, sometimes fighting as many as 12 men in one day. Introduced to boxing, he was brought to America in the late Twenties by a shady promoter with mob ties. Soft-spoken, affable and utterly guileless, Carnera would be mercilessly exploited, embarking unawares or, at least, gullibly, in a world-spanning series of fixed fights, his opponents — fueled by cash or literally threatened at gunpoint — gamely walking into Carnera’s weak uppercuts and diving operatically for the count. The giant was a sensation, landing on the cover of Time Magazine in October of 1931 even as a newspaperman in England joked about his fights being “as rehearsed as a Shakespeare play”. In February 1933, when one of his opponents died after being knocked out — the man had been ill and desperate for fight money — Carnera’s reputation peaked. In June, he became World Heavyweight Champion in a bout one reporter said was won “with an invisible punch”. Soon thereafter, feeling the heat and having squeezed everything they could out of the Amblin’ Alp, Carnera’s mobster handlers abandoned him, walking away with the millions he had earned. Now booked into real, up-and-up fights, Carnera was led to the slaughter. The sight of the once proud giant helpless, bloodied and battered, shocked America. Humiliated, his career in shambles, Carnera returned to Italy where he was promptly hailed and exploited again, this time as a national hero by fascist leader Benito Mussolini. And yet again, Carnera would be abandoned to his own fate after losing badly in an ill-conceived showdown against Joe Louis, a fight that amounted to a veritable massacre. On his own, surviving as best he could, even scavenging for food through the war years, Carnera made it back to the States after the war for an unlikely but spectacular comeback, becoming one of the most popular and beloved pro wrestler of the Fifties. Meanwhile, his boxing days proved rich fodder for drama, serving as inspiration for a novel turned into a 1956 Humphrey Bogart movie, The Harder They Fall, with Mike Lane as “Toro Moreno”. Lane, like Carnera, would go on to play Frankenstein’s Monster, opposite Boris Karloff in Frankenstein 1970 (1958). Another Carnera-inspired piece was Rod Serling’s Requiem for a Heavyweight, produced for television in 1956 with Jack Palance playing “Mountain McClintock”. A 1957 British TV version had Sean Connery in the role and a film adaptation from 1962 starred Anthony Quinn. Carnera himself appeared in a handful of movies, notably turning up as one of the wrestlers in a tug of war with Mighty Joe Young (1949), even throwing a few punches at Joe, and he would go mano a mano with Steve Reeves in Hercules Unchained (1959). Frankenstein director Walter Grauman hired Carnera for size, bulking him up further with torso padding and thick-soled monster boots. 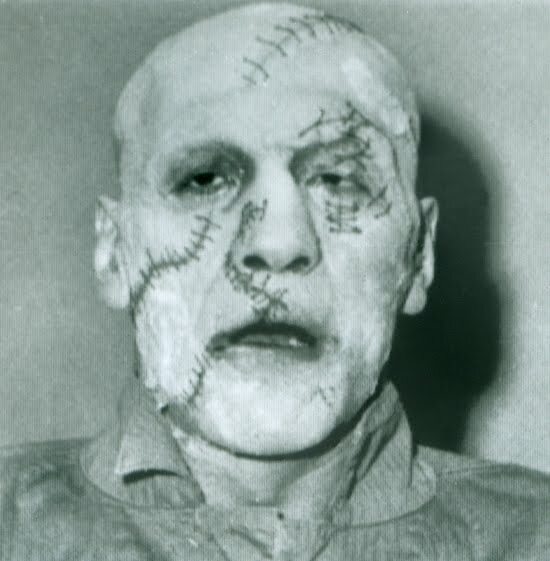 The New York Times reported that “Only television could round out the square head of Frankenstein”, with makeup men instructed to steer clear of Universal’s iconic design from the movies. 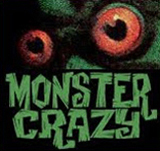 NBC PR claimed that the Monster transformation required a tag team of five makeup artists working in shifts over a period of three hours. The Monster’s appearance, bald head crisscrossed with baseball stitches, is similar to that of Lon Chaney in the Tales of Tomorrow Frankenstein episode of 1952, and anticipates the makeup sported by Robert DeNiro in the 1994 film, Mary Shelley’s Frankenstein. The photograph at hand is actually from a dress rehearsal. It was circulated to newspapers on January 31, five days ahead of the February 5 broadcast. Note how the futuristic costume — called “a snowsuit” by one reporter — and somewhat reminiscent of the outfit James Arness wore in The Thing (1951), is unfinished, with threads hanging and material wrapped loosely around the arms. The collar of the outer garment appears to have been cut away, with flap pockets removed and front opening sewn shut. This clearly being a work in progress, the final makeup and costume might have been a bit different by showtime. It’s impossible to know for sure, as the Frankenstein episode, like much of early live television fare, is considered lost. One might entertain the hope it can still be found as it was one of the few episodes of Matinee Theater to ever be rerun — on October 7, 1957 — meaning that there was, at least, a kinescope — film shot off a television monitor — made of the broadcast, perhaps even a videotape copy, the still-new technology first introduced in 1956. See a video of director Walter E. Grauman reminiscing about his experiences in early television. In part one, at roughly 35:45, he talks about the Primo Carnera Frankenstein and recalls an on-air incident. The Dark of the Moon, a rare surviving episode of Matinee Theater, starring Tom Tryon as a Warlock, and Gloria Talbott. Both would reunite in 1958 for I Married a Monster from Outer Space. A very short documentary clip gives us a glimpse of Color City Studios and a rehearsal for an episode of Matinee Theater. A complete and detailed episode listing for Matinee Theater. A harrowing 1948 account of Primo Carnera’s life and career, by Jack Sher. Tremendously grateful to you, Pierre,and to my friend George--for finding and for showcasing this photograph. I despaired of ever seeing this image again in my life. I was bedridden with rheumatic fever as a boy during that time and one of my favorite "escapes" many times during the week was to watch Matinee Theatre. But the passing nearly-60 years had left me no memory of the name of the show--and every time I told people about having seen a Frankenstein drama on tv, no one could recall it, no one seemed to know anything about it. And now here it is--proof that I saw what I saw all those years ago! Wonderful to see it here, my friends! Great post. 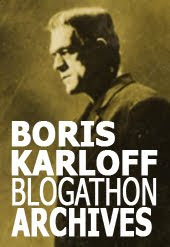 Thanks to you and George for this look back at a forgotten Frankenstein. Thank you...as a fan of Primo's...I loved this piece. A wonderful find and something of which I was unaware. I was six years old when this was broadcast and wonder if my mother watched it when it was broadcast. ernie schaaf was the fighter max baer beat very badly in the ring before he fought carnera. It was generally acknowledged that his death was more from that beating by max baer than the ineffectual flailings of carnera.